This is quite possibly the most disturbing Halloween costume ever. Seriously. It nailed creepy down to a tee. 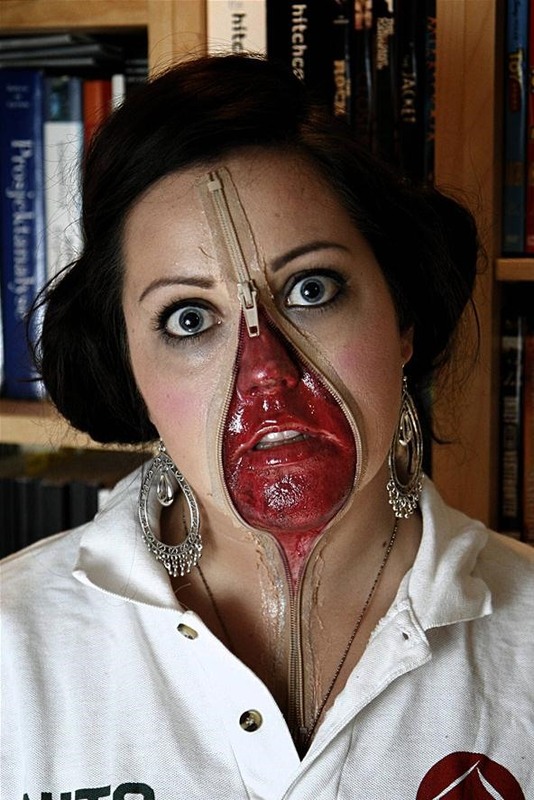 A friend of Redditor YouHadMeAtBacon did this gory unzipped zipper face makeup, and it's by far the best I've ever seen. The following videos were brought to my attention in the comments below. The first one is by C Schönijahn and the second by Rocketcarmike. If you click through to YouTube, there's a brief written guide in each description. If you really want to make one, I suggest using one of the video guides below. BeautyByBrig is up first, whose unzipped face Halloween makeup is topnotch. This one is by beeisforbeeauty. Next up is cristalprostyler's version. And here is BeautifulYouTV's unzipped face tutorial. To go all out and unzip most of your body, Francesco Sanseverino has you covered. Can't decide if you want to be a zombie or zipperface for Halloween? Try both. Use this guide from Shaaanxo. Reveal your inner animal spirit with this clever unzipped look that combines Little Red Riding Hood with the Big Bad Wolf. By NeckUpDesign. Want pro results? Check out this version by ellimacs sfx makeup. If you don't want the whole face unzipped, just do your eyes, as shown below in petrilude's makeup FX walkthrough. Or try out Shuga Be Brave's unzipped eye version. If I had to wager a guess, I'd say she bought a zipper, zipped it up and then opened the middle. Then probably used liquid latex to get it to stick on her face, and used fake blood on the 'exposed' skin in the middle. At least, that's how I'd do it. Wicked cool looking, and an awesome idea! more convincing down the neck then up on the forehead. super cool. It's not hard to wager a guess when she did a poor job of applying it. Love it! It would be cool to be somethng else under it, too, like a bird or something. that's absolutely disgusting, but so freakin awesome! I think a little more time should have been added to make it blend in a bit more; the illusion is lost and it all looks just to obvious. The potential is there and a LOT more could have been done with this. It's been done before (https://www.youtube.com/watch?v=7ju9MGtbRu4) so if you're going to do it, step it up a notch. Wow. I think this is work safe, will try. dats brillaint but were do you buy the zip? please tell me!!! you should be able to get a zipper at any fabric store. This is so disturbingly AWESOME!!! !